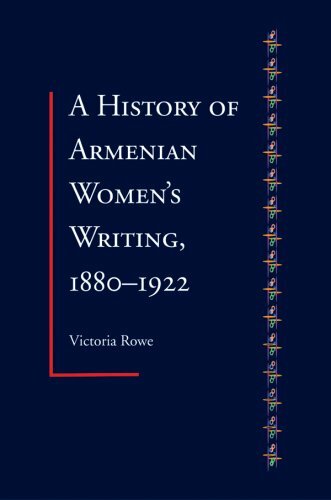 Victoria Rowe’s 2009 book, “A History of Armenian Women’s Writing: 1880-1922,” investigates an area of Armenian literature that has been largely neglected or minimized by historians and scholars: the contribution of Armenian women to literature. Although names like Gregory of Narek, Raffi or Taniel Varoujan may come to mind when thinking about Armenian literature, curiously absent from the canon is the work of the many clever and influential women writers who explored new, revolutionary themes, such as social equality and female empowerment, in their writing. Centering her study on a period of cultural renaissance that thoroughly transformed Armenian society, Rowe examines the work of six women writers and situates each one in her proper socio-historical context to highlight the strength and perseverance that were required of these women to succeed during an era where educational opportunities for women were scarce and where wife and mother were expected to be their only social roles. Rowe closes her book with an invaluable appendix for those interested in women writers, which lists all of the known works, criticism and translations for each of the six writers in addition to biographical information about other women writers of the period. Overall, Victoria Rowe’s groundbreaking book helps Armenian literature enthusiasts gain a new perspective on this revolutionary period and appreciate the obstacles that these women writers overcame in order to succeed. Jennifer Manoukian is a summer intern for the Zohrab Center. She is a recent graduate of Rutgers University and holds a B.A. in French and Middle Eastern Studies. She was delighted to come across this book while doing research for her seni0r thesis on Zabel Yessayan.